One of the biggest repertoires in birddom! Some bird-lovers have tagged the Marsh Wren the "Heinz 57 variety" bird, because scientists have recorded 57 different variations of its song. And nightfall doesn't faze these birds. A male may sing straight through the night. Marsh Wrens usually forage out of view, hopping up only for brief moments. You're most likely to see only movement among the cattails. It's just one of many species to benefit from the North American Wetlands Conservation Act. 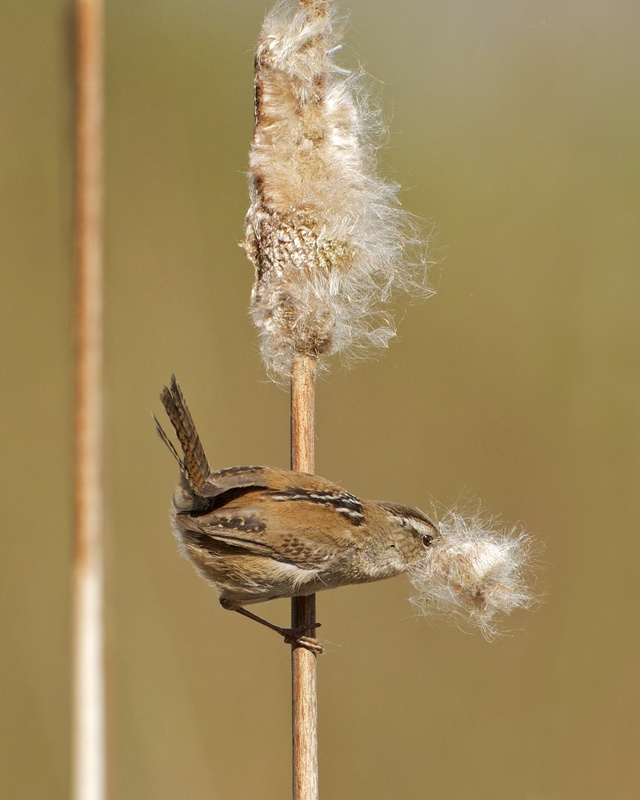 This chatty fellow is a Marsh Wren, a sprightly brown bird with a cocked tail. 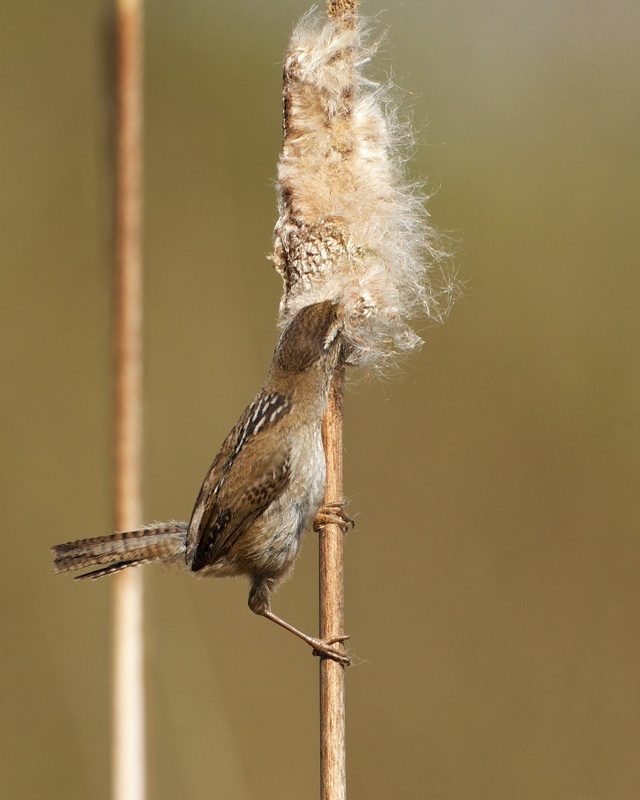 Wrens are known for their amazing singing, including loud, complex vocalizations. And they have a huge repertoire of songs. 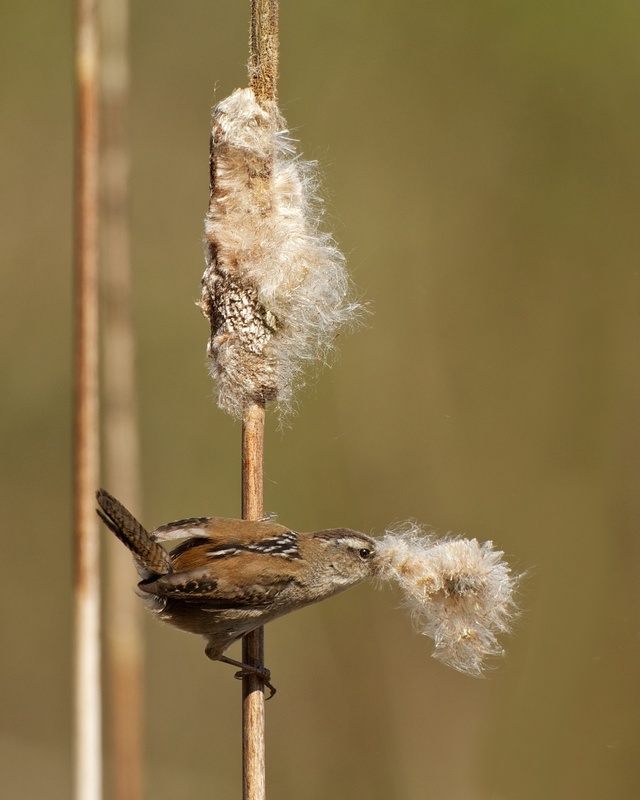 Some bird-lovers have tagged the Marsh Wren the “Heinz 57 variety" bird, because scientists have recorded 57 different variations of its song. That’s quite a mix of notes. Listen for one often repeated phrase, though, a recurring “chugging,” like the sound of a sewing machine or a toy machine gun. 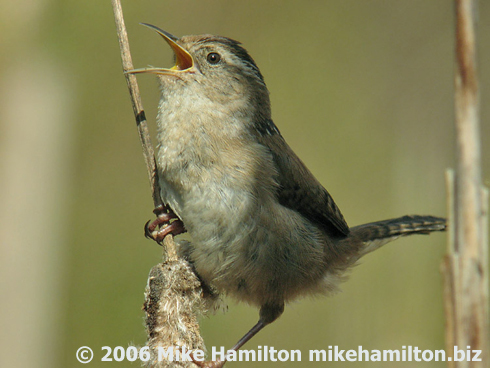 Opinions differ when it comes to describing the singing of the Marsh Wren. Ornithologist Alexander Wilson said its song sounded like “air bubbles forcing their way through mud.” [Bubble sounds] John James Audubon said, “Its song, if song I can call it, … resembles the grating of a rusty hinge.” [Rusty hinge sound] Today, though, all would agree this is just one of many species to benefit from the North American Wetlands Conservation Act. Marsh Wrens usually forage out of view, hopping up only for brief moments. You’re most likely to see movement among the cattails, and not even see the bird, unless it pops up on a cattail to see what you’re doing. Learn more at BirdNote.org. Today’s show brought to you by the Lufkin Family Foundation. I’m Michael Stein. 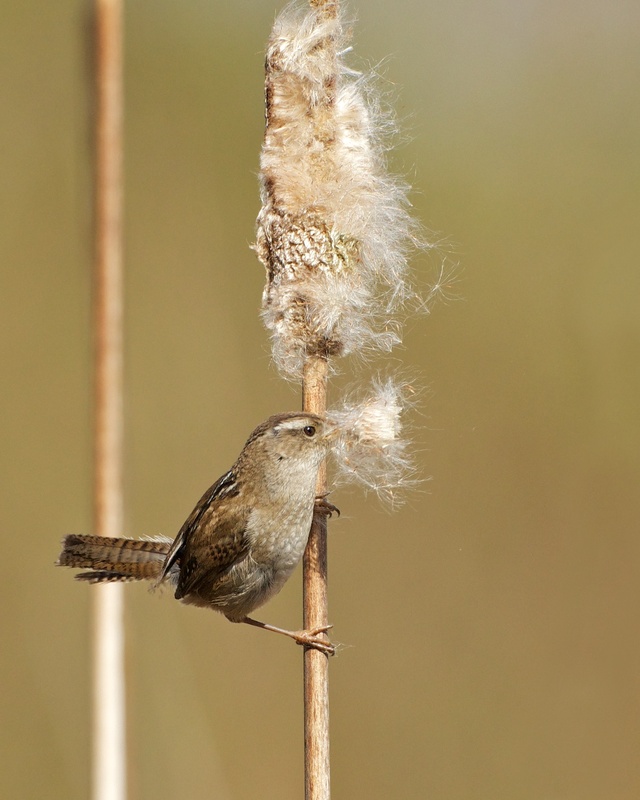 Song of the Marsh Wren provided by The Macaulay Library of Natural Sounds at the Cornell Lab of Ornithology, Ithaca, New York. Recorded by G.A. Keller.